Do you want to know the income of a wedding photographer? Setting your prices too high or too low can hurt your business. In order to set the right prices, you’ll need to do the research to find out what your competition is charging. In this guide, we’ll share how much wedding photographers earn. On an average, the cost for wedding photography ranges between $2500 – $3000 per wedding. However, it’s important to keep in mind that part of that fee must go to cover business expenses. And these numbers are just the average amount – actual prices can vary widely. Wedding photography prices for beginners will be much lower, and highly successful photographers can demand much higher prices. 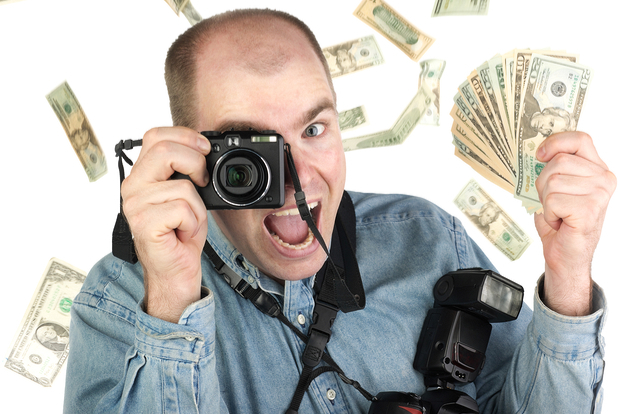 A lot of factors affect what wedding photographers earn for their livelihood. Here are a few key elements you should keep in mind if you want to earn more. Having your own wedding photography business can be more profitable than working under a photographer. And, it’s not that hard to begin. You should check out how to start a wedding photography business to find out how you can get started. Instead of being on a fixed salary, you can charge the client on hourly basis, or create wedding photography packages with a flat fee. Business investments are necessary. You need to keep yourself up-to-date with photography gear. This will surely eat up some part of your income. We recommend you to keep a percentage from all your projects for upgrading your wedding photography gear. This budget can also be utilized on the maintenance of your equipment. The pricing of other wedding photographers in your area will affect how much you can charge. It’s smart to scope out the competition to find out what normal rates are in your location. In the last few years, a DSLR became more common than any other type of camera. You could find college students who own a DSLR are creating Facebook pages as a wedding photographer. But, they aren’t your competition. You should look into digital photography agencies who have added wedding photography as a service. These service providers are the real competition as they can offer huge discounts with their corporate backing. It can be a challenge to become famous with this corporate competition as it definitely affects the income of wedding photographers. In general, you can charge more for bigger weddings. Most beginners should start with small wedding ceremonies. You may earn less money, but it’s a great way to gain experience. Then as you grow, you can start working at bigger weddings and raise your prices. Many big weddings have multiple photographers, so the wedding party’s budget is divided. Still, you’ll usually earn more shooting a big wedding. You may want to check out how to photograph a big bridal party for tips. Your net income will also depend on your other business expenses, such as marketing. Marketing is a crucial investment for growing your business and earning more money. One of the best ways to market your wedding photography business is by creating a website online to attract customers. To learn more, you should check out our guide on how to market your wedding photography business. That’s all for now. We hope this guide has helped you to learn how much wedding photographers make. You may also want to check out our guide on the 21 best free web apps to grow your photography business. Would love to read more on this topic.